When it comes to decorating your living room, one of the most important furniture to decide on is a coffee table. As they are mostly placed in the center of the room, these are often the first piece of furniture that attracts your visitors’ attention. This is why it is essential to find the best modern coffee tables to have a positive first impression on your guests. When buying one, you need to look into different considerations. Are you looking to add some unique and modern style to your room, or do you also want some additional storage space? Similarly, what is the space available for the coffee table? Do you want a wood table or a glass one? Confusing, isn’t it? Don’t worry. We have listed the three best modern coffee tables in this article, so you won’t have to look anywhere else. The first coffee table on our list is from Sauder, a well-known U.S.-based furniture brand that was founded back in 1934. The Sauder 420275 North Avenue Coffee Table is an example of why Sauder is known for their high-end furniture. 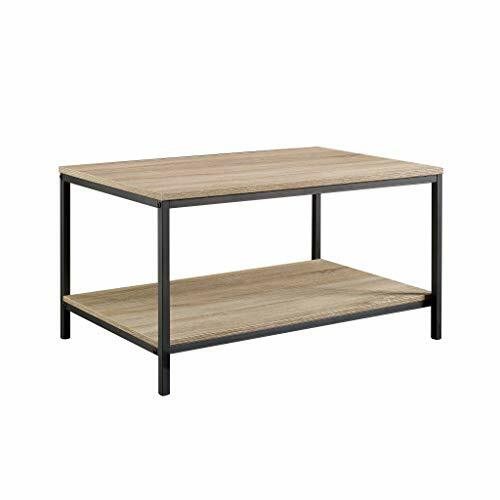 A good option for small living rooms or apartments, this coffee table not only adds a modern style to your living space but also ample storage space. This coffee table’s multi-purpose dual-shelf open design offers both convenience and style. Even with a compact design, it provides you with enough storage. The top shelf is placed about 13 inches above the bottom shelf while the bottom shelf also remains several inches (three inches) above the ground. Both shelves are supported by a black metal frame, which adds to its durability and stability. The shelves are also made of environment-friendly engineered wood, which was obtained from softwood residuals combined with high-quality hardwood. This makes sure that no wood is wasted during the process. This coffee table comes with a charter oak finish that makes it an attractive piece of furniture to add to any living room. Finished from all sides, the table allows you the freedom to position it any way you want. Overall, the engineered construction makes it a very sturdy design that makes it a wise investment. The dimensions of the table are 31.5 inches long, 20 inches wide, and 16.5 inches high. It weighs around 26 pounds, which makes it a lightweight table for its size and storage capacity. Second on our list is a coffee table from Niangua Furniture, which is also a U.S.-based furniture manufacturer that is best known for their high-end handmade furniture. 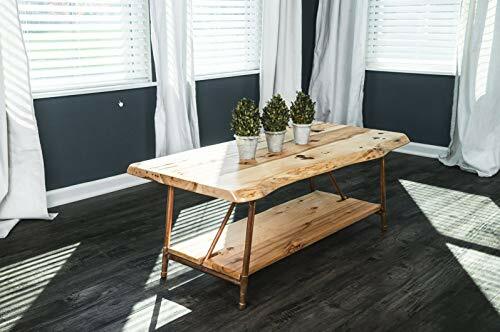 The Live Edge Rustic Coffee Table is one of their best products to offer. It was designed to bring your room or patio to life. This coffee table also comes equipped with double shelves, but it is much larger than our first option. The top shelf is also longer and wider compared to the bottom one, providing you with more space to keep your stuff on the top shelf. Both the shelves are made of wood obtained from hickory trees in Ozark forest situated in Missouri. The shelves are also supported by nostalgic copper pipes that make the structure sturdy and eye-catching. The live edge is also retained by the manufacturer to give it a more realistic wood appearance. The dimensions of the table are 48 inches in length, 18 inches in height, and 23 inches in width. Each slab is almost two inches thick, allowing you to put even heavy objects on the shelves. The weight is around 75 pounds, which makes it slightly heavier because of the thick slabs of woods used. The last coffee table on our list is also from Sauder as they offer a wide range of options when it comes to coffee tables and other types of furniture. The Sauder 414970 Harvey Park Coffee Table is a good option for those who are looking for something different from rectangular design. In addition, when the first two options are made of wood, this coffee table boasts many glass features. Do you think this might be the one you’re looking for? Let’s find out! 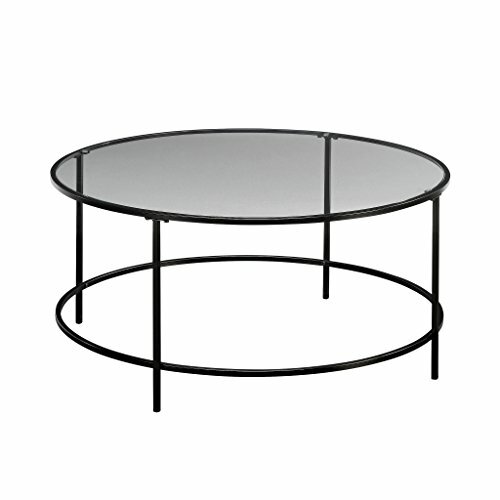 The Sauder 414970 Harvey Park Coffee Table comes in a circular design with the top shelf made mostly of high-quality, safety-tempered glass. The table is also finished on all sides, and it is supported by a black metal construction. This makes it long-lasting and strong. Its sleek and minimalist design makes it a good addition for small living rooms. You have an option to choose between the black or clear glass, while the transparent glass is also of very high-quality. The dimensions are 36 inches in diameter and 16.5 inches in height. The circumference of the glass is slightly above 113 inches, providing you enough space to put several items on the table. It weighs around 30 pounds, which makes it easy to carry and move around even by one person. When all three of our listed coffee tables are among the best options out there, they all come with distinct features. The Niangua Furniture Live Edge Rustic Coffee Table is our recommended choice if you have a taste for craftsmanship and handmade designs. If you are someone who is looking for a compact coffee table—probably for a small apartment or small living room—the Sauder 420275 North Avenue Coffee Table is a perfect option due to its small design. For larger tables, both the Niangua Furniture Live Edge Rustic Coffee Table and Sauder 414970 Harvey Park Coffee Table are good options. However, one is made of wood and available in rectangular design while the other is made of glass and available in a circular design.